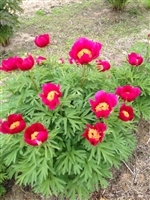 Rock garden peonies for sale to gardeners. Rock garden peonies for super impact early in the season. This fern leaf peony is one of the earliest herbaceous peonies to come up in the garden.